The jury may still be out on the usefulness of the Internet of Things, but payments giant Visa is 100 percent sure it doesn't want to miss out. Today it announced plans to push Visa payments into numerous fields. We're talking "wearables, automobiles, appliances, public transportation services, clothing and almost any other connected device" -- basically, anything that can or will soon connect to the internet. 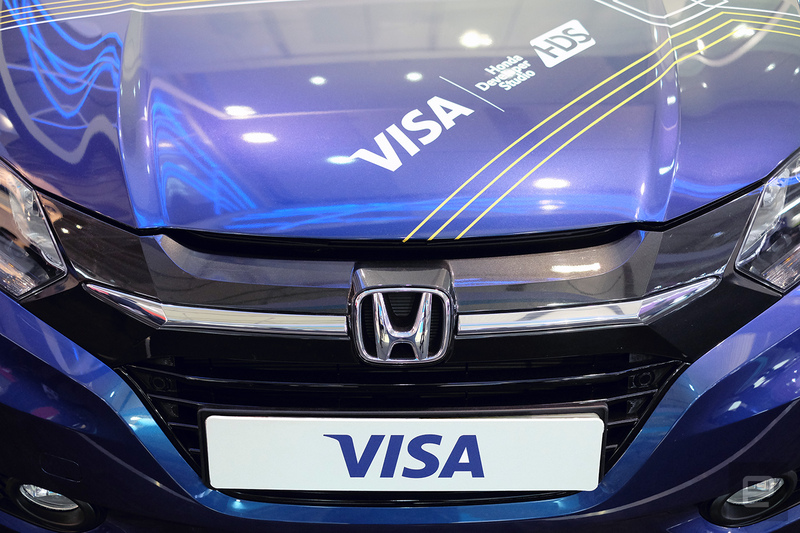 Visa imagines a future where you'll be able to pay for parking from your car dashboard or order a grocery delivery from your fridge. It makes sense, then, that Samsung is one of the first companies to sign up to the Visa Ready Program, alongside Accenture, universal payment card company Coin and Fit Pay. Chronos and Pebble are also working to integrate secure payments inside their devices. 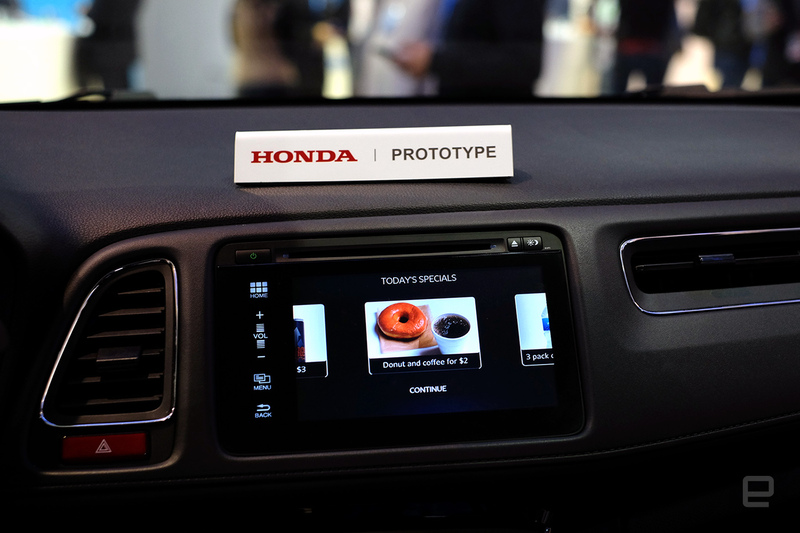 To show off the technology, which works with any credit card, Visa or otherwise, the company joined with Honda to develop an in-car app that helps automate payments. Right now they have two demos, the first of which concerns refueling: It warns the driver when her fuel level is low and directs her to the nearest gas station. Once the car arrives at the pump, the app calculates the expected cost and allows the driver to pay for the fuel without having to leave the vehicle. There are layers that can be added to the experience -- Visa's just building the framework here. The first, which was demoed, lets you browse the gas station's convenience store, adding a doughnut or a coffee to your order. But there are more practical uses, too, like pulling in real-time prices for gas around you and directing you to the station with the lowest prices. The second demo is all about parking. Visa imagines a world where parking meters have Bluetooth LE or some similar technology. When your car enters park mode, it'll automatically detect which space you're in, tell you about your options ($2 for 20 minutes, $5 for an hour, etc.) and let you make a payment with one click. Of course, it'll automatically extend the payment for as long as necessary, but some spaces have a hard limit on how long you can park. To that end, the parking demo pairs with a companion app so you can keep an eye on how long you've got until you have to return to your car. 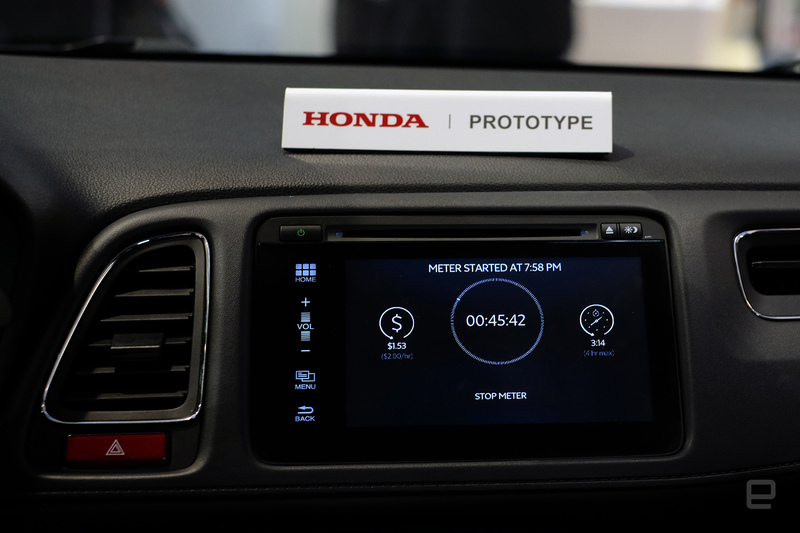 Both demos appear pretty seamless, but for them to work in the real world they'll require gas stations, parking lots and other businesses to integrate lots of tech. They'll also need an internet connection, of course, either via a tethered phone or your car's connection, if it has one. Visa will start running pilots for the fuel app around California in the coming months and is also planning to test the parking app point this year.